How did Socrates teach only using questions? Socrates was fundamentally concerned with the practical issue of helping people develop the reasoning abilities requisite to living a rational life. The Socratic Method is a way to seek truths by your own lights. A Socratic dialogue reveals how different our outlooks can be on concepts we use every day. It reveals how different our philosophies are, and often how tenable—or untenable, as the case may be—a range of philosophies can be. Moreover, even the most universally recognized and used concept, when subjected to Socratic scrutiny, might reveal not only that there is not universal agreement, after all, on the meaning of any given concept, but that every single person has a somewhat different take on each and every concept under the sun. Socrates used his method as a guide to help people show themselves they didn’t know what they thought they knew. He exposed untrue beliefs, developed a sense of disquiet in his interlocutors, and elicited contradictions by asking pointed question in an unthreatening way. These conversations forced people to substantively evaluate, and in many cases ultimately change, their beliefs. In its purest form, questions (and only questions) are used to arouse curiosity and at the same time serve as a logical, incremental, step-wise guide that enables students (Socrates referred to the partner as the “interlocutor”) to figure out a complex topic or issue with their own thinking and insights. Better understand what you and others believe. There are no specific prerequisites to this course. Students may benefit from first completing the Practicing Dialogue course. The course contains many hyperlinks to further information. Use your judgment and these link following guidelines to decide when to follow a link, and when to skip over it. This course is part of the Applied Wisdom curriculum. If you wish to contact the instructor, please click here to send me an email or leave a comment or question on the discussion page. The inquisitor asks the interlocutor questions about the hypothesis. 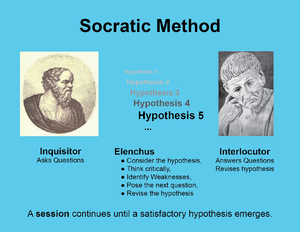 The basic elements of the Socratic Method are shown in the diagram to the left. Two people engage in a thoughtful and focused dialogue. The inquisitor is the teacher who poses questions. The interlocutor is the student answering those questions. In response to a question posed by the inquisitor, the interlocutor answers by forming the initial hypothesis—a tentative answer to the question. The method proceeds as a form of cooperative argumentative dialogue, called the elenchus, between the inquisitor and the interlocutor. The participants think critically, identify weaknesses in the hypothesis, the inquisitor poses the next question, the interlocutor answers, and the hypothesis is revised to reflect the new understanding. This proceeds until any identified weakness has been driven out of the hypothesis. Attribution: User lbeaumont created this resource and is actively using it. Please coordinate future development with this user if possible. Wonder—The process begins when curiosity and our drive for intellectual exploration leads naturally to asking questions. From wonder a hypothesis emerges. Hypothesis—A speculative response to the question arising from our wonder forms the hypothesis. Socrates' interlocutor asserts a thesis, for example "Courage is endurance of the soul", which Socrates considers false and targets for refutation. Socrates secures his interlocutor's agreement to further premises, for example "Courage is a fine thing" and "Ignorant endurance is not a fine thing". Often counterexamples are used to challenge the hypothesis and demonstrate why it is not correct. Socrates then argues, and the interlocutor agrees that these further premises imply the contrary of the original thesis; in this case, it leads to: "courage is not endurance of the soul". Socrates then claims that he has shown that his interlocutor's thesis is false and that its negation is true. Accepting or Revising the Hypothesis—If the hypothesis has withstood examination in the elenchus stage, then the hypothesis stands and the next stage can begin. Otherwise, a revised hypothesis is proposed to incorporate what was learned above, and the elenchus begins with this new hypothesis. Acting accordingly—The participants now apply what has been learned. This may entail revising a previously held belief, reflecting on the session, wondering about something in a new way, agreeing to meet again, or changing behavior. The key tasks requiring the most skill and good judgment are: choosing the interlocutor, choosing the first question, choosing the next question, and deciding when to stop. A particular Socratic Method session is successful if all parties feel enhanced by the experience. Gaining new insights, increasing the understating of your own beliefs, identifying hidden assumptions, correcting fallacies, exploring new viewpoints, knowing how you know, and dismissing falsehoods are often good experiences and may even be exhilarating. But the session can go badly. If the interlocutor feels pressured, embarrassed, belittled, humiliated, bullied, or otherwise feels diminished or threatened by the experience, the session may have caused harm. Although the outcome cannot be predicted with certainly, there are certain conditions that favor a beneficial outcome. Humility is the essential prerequisite for learning. Unless both parties are open to learning from the experience, there is nothing to be gained from engaging each other. doxastic openness. Doxastic openness is a technical term related to humility that basically means “I am willing to change my beliefs based on a new or better understanding of evidence”. If the interlocutor is doxastically closed and neither evidence nor reasoning can be sufficient to change his beliefs, then the Socratic Method is futile and is likely to do more harm than good. A successful application of the Socratic Method requires the interlocutor (and perhaps the inquisitor) to change their beliefs or behavior. Therefore it is important to be able to assess the interlocutor’s readiness to change with respect to the topic at hand. The following framework can help us understand and discuss readiness for change. The transtheoretical model of behavior change assesses an individual's readiness to act on a new healthier behavior, and provides strategies, or processes of change to guide the individual through the stages of change to Action and Maintenance. In the transtheoretical model, change is a "process involving progress through a series of stages:"
Termination – "Individuals have zero temptation and they are sure they will not return to their old unhealthy habit as a way of coping"
When choosing an interlocutor and preparing to use the Socratic Method, it is helpful to assess the interlocutor’s readiness for change by determining the stage they are currently in for the topic at hand. This can be done by asking about readiness to change in a variety of specific situations. For example, asking “What evidence would cause you to change your belief in X?” or “What would cause you to stop doing X?” can help judge their readiness to change. A goal of the session is to help the interlocutor move from their current readiness state to the next state. In addition, a good relationship with the interlocutor, a convenient time and place, minimal distractions, time to devote to the method, a positive attitude, shared expectations for the session, and demonstrated respect for each other also contribute to a successful session. While it is important the Interlocutor be receptive, it is essential the Inquisitor be prepared with a temperament suitable to the conversation. The Socratic Inquisitor loves to discover her own errors. The capacity to examine our own cherished ideas and beliefs without the fear of replacing them with something better is an essential part of the Socratic Temperament and the Socratic Method. This is humility in action. The Socratic Inquisitor is in touch with her own ignorance. Because the Socratic Teacher knows that her ignorance touches every area of life, student participation and answers are naturally treated with respect. The Socratic Inquisitor models the joy of hard work in the quest for knowledge. This is fun because it is hard. The Socratic Inquisitor experiences deep curiosity and the desire for self-improvement. We never stop learning from each other. The purpose of living such a temperament in the presence of your students is to give them the ability to discover their own Socratic temperament. Of course you will want to consider questions that are interesting, important, and relevant to the discussants. Not all interesting questions are suitable to considering with the Socratic Method. Matters of fact. These can be answered through the correct use of evidence gathering, and reasoning. There is a generally accepted correct answer to these types of questions. These questions ask “what is” and careful researchers agree on the answer. Examples include: What is the boiling point of water? Is lead more dense than gold? What movie won the academy award for best picture last year? Do not argue matters of fact, research them. Matters of taste, preference, or opinion. Any answer is acceptable here, because the answer depends only on the preferences of the person answering. Examples include: What is your favorite color? Do you prefer vanilla or chocolate ice cream? Was Picasso or Rembrandt the better artist? Do not argue matters or preference, enjoy them. Matters of controversy. Although these are not opinions, sincere experts often disagree on the best answer or the best course of action. These questions ask “what ought to be” or they ask about a topic that is not yet carefully explored or researched. Only questions of this type are suitable for exploring using the Socratic Methods. Examples include: What are the most pressing problems facing people today? What is the best approach to reducing gun violence? Are incarceration rates too high? Learn more about matters of controversy by exploring them with the Socratic Method. When choosing a question to begin a Socratic Dialogue, ensure it is neither a matter of fact nor a matter of preference, but rather a matter of controversy that will require exercising reasoned judgement to explore. Read over this list of questions to classify. Identify at least five of these questions in each of the following classifications: 1) matters of fact, 2) matters of preference, or 3) matters of controversy, suitable for study using the Socratic Method. With a question posed, the interlocutor will propose a hypothesis—a speculative response to the question. The inquisitor considers the current hypothesis and chooses the next question. This is perhaps the most difficult task in the process. It requires experience and experts often make this choice intuitively. However, these are some steps to follow, or some considerations to apply, when choosing the next question. Begin by examining the hypothesis to determine if it is clear, correct, and relevant to the topic being explored. If the hypothesis is acceptable, then the elenchus has completed successfully and the process can move on to the final stage where participants assimilate what they have learned into new actions. In most cases, the hypothesis will not be acceptable, the inquisitor will then have to identify the most salient weakness in the hypothesis, and form the next question. Often the inquisitor will proceed by offering a counterexample to the hypothesis to demonstrate some exception the hypothesis does not properly consider. Alternatively, the inquisitor may identify some weakness in definitions proposed or relied on. Socrates applied a strict standard for accepting a definition. When Socrates asks a question such as “What is reverence?” he has in mind a question that can be answered only in certain ways. To begin with, he will not be satisfied with an answer that points only to a certain kind of reverence, or only to an example of reverence. The answer must identify a feature that: 1) belongs to every kind of reverence (meets the generality requirement), and 2) to nothing that is not reverent (meets the exclusion requirement), and 3) has explanatory power. A definition must state the essence of the thing being defined, by contrast with a statement of that thing's non-essential attributes; such a statement could be true without qualifying as a definition. If the current hypothesis is not clear by the above standard, or it uses words that are not clear by the above standard, then pose a question for clarification. Think critically about the hypothesis. The hypothesis may be weak for a variety of reasons. Examine the hypothesis to identify any weakness it may have. Consider the types of weaknesses described in the left hand column of the table below. Use the example questions to help form your next question. What do you mean by …? Can you say more about what you mean? What is the purpose of …? What is the purpose of addressing this question at this time? Is this the most important topic for us to explore? Is that assumption well founded? What happens if our assumptions are faulty? Can we all accept the assumption of …? What it the evidence for this? What is the evidence against this? Is this based on authority or on evidence? What variety of viewpoints have we considered? What additional viewpoints should we consider? How would the … group assess this? What objections would other groups raise? Who have we spoken to about this? What would a global perspective look like? If that happened, what would be the result? What is the best we can expect to happen? Can we break this into simpler questions? What are we really asking here? Is this a question of fact, preference, or true controversy? Do we all agree this is the best question to pursue? What is the problem really? What is the main idea we are exploring? How would you define … ? How is this different from …? Is this the same as …? What ambiguities do you see? How is the ambiguity around … most likely resolved? A question that poses a false dilemma and presents only limited alternatives to consider, when in fact there are more options. If the process has elicited a hypothesis that is clear, correct, and relevant to the topic being explored, congratulations, the process has been successful! The process can now move on to the final stage and participants can now act in new ways according to the new insights learned. If the process is taking more time that has been planned for, then suspend the process and agree on the next steps. Participants may agree to: 1) meet and continue the process, 2) stay in touch, 3) reflect on the session, 4) abandon the inquiry indefinitely, or 5) leave the next steps unspecified. If the process is becoming stalled or is causing distress, then break off, work to address and remedy any lingering concerns, and work to strengthen the relationships among the participants. Find someone who wants to practice with you. Choose a question from this list of prompts. Practice the Socratic Method beginning with the question you have chosen to study. Use this session to engage in meaningful conversation or explore significant concepts. Modern debate-oriented discussions focus on winning rather than on gaining insight. The focus of modern moral debate is so broad it can include inappropriate ad hominem attacks and misleading statements. The Socratic focus is much narrower. The discipline of Socratic conversation is in the ability to persist in questioning a single idea. This willful repetition affords us the experience of seeing a much richer variety of answers and possible views come into play. This is part of the value of the focus of the Socratic Method. It is the variety of responses that must inevitably come when we persist in questioning an idea that makes our conversation more useful. Modern debates usually offer two views that formally deny each other. This often creates a false dichotomy because most subjects that have any bearing on moral issues are more complex than a mere two sided debate can address. The Socratic method persists with a basic question and does not let go until an answer that can stand up to examination is found. This is a far more creative and fertile mode of conversation than mere debate. This is not an attack, instead it is the creativity of teamwork towards a common goal. Debates are fueled by arrogance and certainty, inquiry is fueled by humility and curiosity. Complete the Wikiversity course on Practicing Dialogue. Studying the original Socratic Dialogues provides masterful yet dated examples of the method in use. Perhaps the most instructive example is Meno, one of many Socratic Dialogues written by Plato. Read Meno. Notice how Socrates chooses the next question to ask throughout the dialogue. What is the most clever intellectual move Socrates makes during the dialogue? What does Meno learn? What does Socrates learn? What is the source of that new understanding? Optionally study other Socratic Dialogues. Many variations in the use and application of the technique have evolved since the days of Socrates. One important change is the extent to which the inquisitor has an outcome in mind at the start of the session. In the classical technique, the inquisitor is ambivalent to the outcome and genuinely intends to learn along with the interlocutor as the conversation progresses. In many modern applications, the inquisitor has a specific outcome in mind from the start. This is essential during teaching applications and often present when it is used to influence belief in a predetermined direction. It is disingenuous for the inquisitor to mislead an interlocutor by representing the session as unbiased if the inquisitor already has an outcome in mind. Today the Socratic Method is used in several ways. Below are some modern examples of where it is being practiced. Study any of these you find interesting. People may wish to observe, participate, or lead sessions using the Socratic Method as a way to learn more about the method, to learn more about the topic being examined, or to enjoy more engaging interactions with other people. Because the Socratic Method challenges assumptions, beliefs, and unclear thinking evident from the initial hypothesis, it can be used to challenge unfounded beliefs and may lead to new insights, or may cause someone to change their long-held, yet poorly examined beliefs. Street Epistemology is a way of having more productive conversations with believers to help them re-examine the foundations of their beliefs. It examines the question “Is faith a reliable epistemology.” Many videos provide examples of street epistemology in practice. Motivational Interviewing is a method that works on facilitating and engaging intrinsic motivation within the client in order to change behavior. It is a goal-oriented, client-centered counseling style for eliciting behavior change by helping clients to explore and resolve ambivalence. The Socratic Method can be a useful technique in many forms of psychotherapy where it is used to help a person change and overcome problems in desired ways. Socrates believed that the Socratic Method was the only valid path to learning. We saw in Meno how the Method elicited latent knowledge from the slave. The Method has great potential as a teaching tool. The Socratic method is a powerful tool to inspire students to take a deep interest in their own enthusiastically willful education and thriving in life. The Socratic Approach to Character Education, David H. Elkind and Freddy Sweet Ph.D. The casebook method is the primary method of teaching law in law schools in the United States. It is an adaptation of the Socratic Method. Choose a meaningful question to explore using the Socratic Method. Choose a partner to act as the interlocutor. Act as the inquisitor as you use the Socratic Method to learn more about the question. Students may wish to study several of these resources used in creating this course. The Center for Critical Thinking and Moral Critique and the Foundation for Critical Thinking — two sister educational non-profit organizations — work closely together to promote educational reform. They seek to promote essential change in education and society through the cultivation of fair-minded critical thinking. The Socratic method research portal is dedicated to advancing the use of the Socratic Method. The Skeptical Studies Curriculum Resource Center is a comprehensive, free repository of resources for teaching students how to think skeptically. The Stanford Encyclopedia of Philosophy article on Socrates provides an interesting biography and analysis of his life, teachings, and influence. Students interested in learning more about Socratic Methods may be interested in these materials. Paul, Richard; Elder, Linda (December 5, 2014). Thinker's Guide to the Art of Socratic Questioning (Thinker's Guide Library),. Foundation for Critical Thinking. p. 134. ISBN 978-0944583319. Boghossian, Peter (November 1, 2013). A Manual for Creating Atheists. Pitchstone Publishing. p. 280. ISBN 978-1939578099.
de Bono, Edward (August 18, 1999). Six Thinking Hats. Back Bay Books. p. 192. ISBN 978-0316178310. Quinn, Daniel (May 1, 1995). Ishmael: An Adventure of the Mind and Spirit. Bantam. p. s263. ISBN 978-0553375404. Miller, William R; Rollnick, Stephen (September 7, 2012). Motivational Interviewing: Helping People Change. The Guilford Press. p. 482. ISBN 978-1609182274. ↑ Paul, Richard; Elder, Linda (December 5, 2014). Thinker's Guide to the Art of Socratic Questioning (Thinker's Guide Library),. Foundation for Critical Thinking. p. 134. ISBN 978-0944583319. ↑ Boghossian, Peter (November 1, 2013). A Manual for Creating Atheists. Pitchstone Publishing. p. 280. ISBN 978-1939578099. Chapter 5. ↑ From Boghossian, Peter (November 1, 2013). A Manual for Creating Atheists. Pitchstone Publishing. p. 280. ISBN 978-1939578099. , attributed to: Dye, J. (2007, February 7) Socratic method and scientific method. ↑ Boghossian, Peter (November 1, 2013). A Manual for Creating Atheists. Pitchstone Publishing. p. 280. ISBN 978-1939578099. ↑ Paul, Richard; Elder, Linda (December 5, 2014). Thinker's Guide to the Art of Socratic Questioning (Thinker's Guide Library),. Foundation for Critical Thinking. p. 134. ISBN 978-0944583319. Three Kinds of Questions. ↑ Adapted from: Designing Effective Projects: Questioning, The Socratic Questioning Technique, Intel Teach Program, Designing Effective Projects. ↑ Adapted from Questions for a Socratic Dialogue, adapted from Paul, Richard; Elder, Linda (December 5, 2014). Thinker's Guide to the Art of Socratic Questioning (Thinker's Guide Library),. Foundation for Critical Thinking. p. 134. ISBN 978-0944583319. . Details may be found at www.criticalthinking.org Refer to these sources for more detail. ↑ Gause, Donald C.; Weinberg, Gerald M. (March 1, 1990). Are Your Lights On? : How to Figure Out What the Problem Really Is. Dorset House Publishing Company. p. 176. ISBN 978-0932633163. ↑ How to Use the Socratic Method, by Max Maxwell and Melete, The Socratic Method research portal.